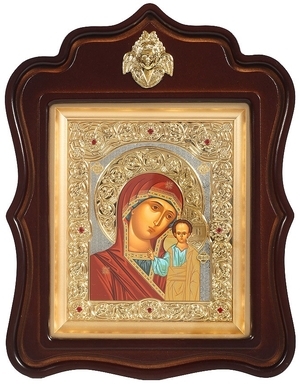 Religious icons: Most Holy Theotokos of Kazan - Istok Church Supplies Corp. Traditional Orthodox Christian icon of the Most Holy Theotokos of Smolensk. Painting, tempera, brass, gold-gilding, nickel-gilding. Solid wood case. Size: 12.2''x15.9'' (31x40.5 mm).